The German Democratic Republic, Deutsche Demokratische Republik, or "DDR", was the socialist state established in 1949 in the Soviet Zone of occupied Germany and in the Eastern zone of the Allied occupied capital city of Berlin. The new state, shown in red in the Allied Occupation Zones map at left, bordered on West Germany in the South and West, Czechoslovakia in the South, the Baltic Sea in the North, and on Poland in the East. Soviet premier Josef Stalin established the Democratic Republic in 1949. The Soviets turned control of East Germany over to the Communist Party, headed by Wilhelm Pieck (1876–1960). As was later noted, everything was made to look democratic, while in reality, the Communists retained control of the government. The Communists were completely loyal to Stalin, and they realized that their regime would collapse, if it lost the backing of the Soviet army, as indeed happened in 1989. Actually, seven years after the Allies’ Potsdam Agreement to have a unified Germany, in March 1952, the USSR proposed German reunification, as well as Allied disengagement from Central Europe. The three Western Allies rejected the proposal. After Stalin's death in 1953, his successor, Nikita Khrushchev, rejected reunification, as being equivalent to returning East Germany for annexation to the West. Philatelically, the DDR issued postage stamps primarily for the purpose of spreading their political and social propaganda. As with the USSR and the other Eastern European Communist countries, the DDR issued numerous stamps and sets of stamps during each year. They even employed the practice of printing one particular denomination in a set of stamps in much smaller quantities than the other stamps in the set, in order to elevate the market prices for that particular stamp. In its 41 years of existence, the German Democratic Republic issued over 3,400 postage stamps. It would be impossible to display them all in pages associated with this section. Such an endeavor would take an entire website in itself. Eventually thematic subject pages on the postage stamp issues of the DDR will be included in the first link section below. The postage stamp in the scan at the top of this page was the first official commemorative stamp issue of the DDR. It was issued on October 9, 1949 to commemorate the 75th Anniversary of the Universal Postal Union. The postage stamp in the scan directly above was issued December 1, 1951 to publicize the Month of Soviet-German Friendship. 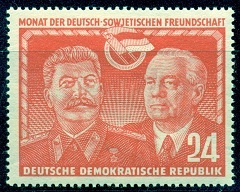 The stamp depicts Josef Stalin and Wilhelm Pieck, the contemporary leaders of the USSR and the DDR. In 1989 a popular uprising overthrew the Communist regime. 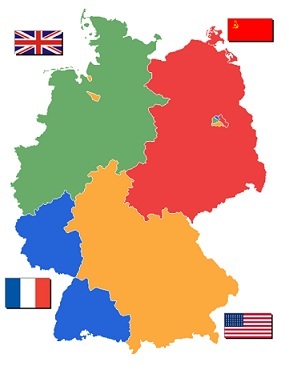 On August 23, 1990, the Volkskammer (People's Chamber) restored the five pre-war states of Brandenburg, Mecklenburg-Vorpommern, Saxony, Saxony-Anhalt, and Thuringia for the reunification of East Germany to West Germany. These states of the German Democratic Republic were integrated as new states into the Federal Republic of Germany (BRD) on October 3, 1990, and the two former German countries became a single nation. 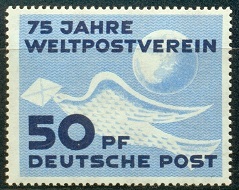 The postage stamps shown in the scan above were the final stamps issued by the DDR. They were issued on October 2, 1990 to publicize the International Astronautics Federation's 41st Congress in Dresden. 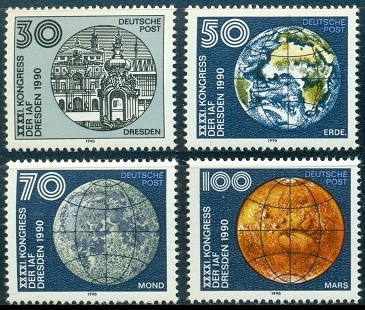 The stamps depict the Dresden skyline, a globe, the Moon, and Mars. The postage stamps of the German Democratic Republic were replaced by those of the Federal Republic of Germany starting October 3, 1990.